It is usually said that titanium white pigments date from 1920, but this belongs to the history of industrial manufacturing. The history of the pigment itself begins c. 1800 when it was being used as a pigment in the ceramic arts for yellow glazes. By around 1900 it began to be used by painters, it having been found, for example, on the easel of the Impressionist painter, Camille Pissarro, who died in 1903. So when titanium white is detected in paintings by early modernists, its presence should no longer cause surprise or imply doubt about their authenticity. Titanium white, a composite pigment made up of a small amount of titanium dioxide white plus barytes (barium sulphate), and another extender such as china clay (kaolin), zinc white, or chalk, was available to painters from at least the 1890s, or even earlier for the most enterprising. So every painting that would date from before 1920 and which has been rejected on the grounds of the presence of titanium white should be re-examined in light of the facts of this pigment, which are presented here as an annotated chronology. It is a work in progress, to which information will be added as it becomes available. 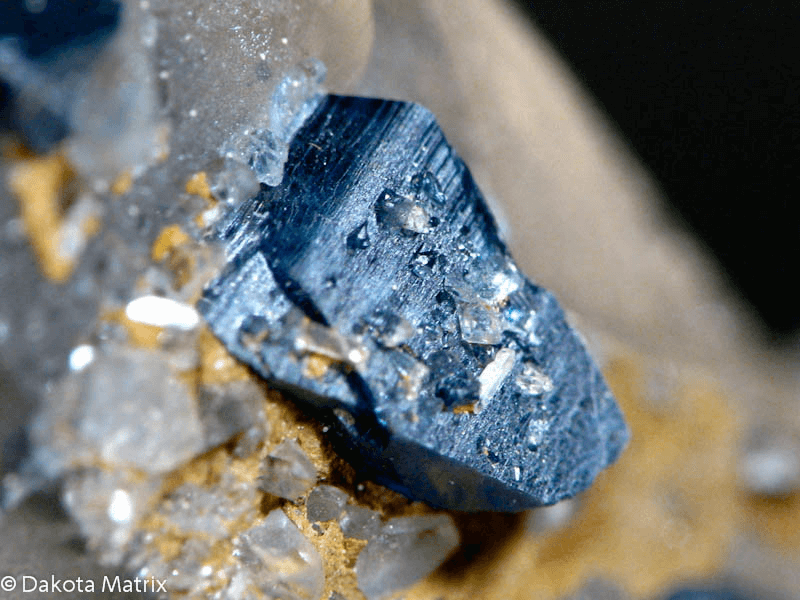 NAMES – 1791: Manaccanite. 1795: Titanium. 1801: Anatase. 1803: Rutile. 1827: Ilmenite. 1791 The Rev. William Gregor (1761-1817), an amateur geologist, discovered titanium in sands he had collected in a stream near his village of Manaccan, in Cornwall, and he called it manaccanite. Gregor’s experiments on the metal were published as, “On Menaccanite, a Species of Magnetic Sand, Found in the County of Cornwall”, “Sur le Menakanite, espèce de Sable attirable par l’Aimant, trouvé dans la Province de Cornouilles”, Observations et Mémoires sur la Physique, Paris, 39: 72–78, 152–160. 1795 Martin Heinrich Klaproth (1743-1817), a Berlin chemist, was examining the mineral, “Hungarian red tourmaline”, and identified in it a metal which he named titanium. He published his findings, and the name, in, “Chemical Investigation of the So-called Hungarian Red Tourmaline”, Klaproth’s Contributions to the Chemical Knowledge of Mineral Substances (Klaproth’s Beiträge zur chemischen Kenntniss der Mineralkörper Vol. 1, Berlin, 1795, 233-244; “Analyse chimique du Schorl rouge de Hongrie”, translated by Citoyen Hecht, Journal de Mines, Paris, Vol. 12, 1796, 1-9). There Klaproth described his experiments with this “red tourmaline”, to be named “rutile” in 1803, using both the wet and dry methods, by which he determined that this was a metal, in fact an oxide due to its affinity with oxygen. He named it “titanium”, explaining that not having characteristics that suggested a name, he would “borrow one from mythology, as I have already done for uranium, for the new name of this metallic body and I will call it titanium, in honour of the Titans, first children of the earth. Thus the red tourmaline will be a titanium oxide.” (Journal des Mines, 9) In his experiments to decompose the rutile in order to discover its nature, Klaproth settled on a basic white substance which he subjected to differing heats, alkalis and acids. They produced various colours and their reactions also convinced him that he had discovered a new metal. Klaproth’s Basic White Substance: Titanic Oxide – Ground rutile mixed with potassium carbonate and heated in a porcelain pot was then poured out to cool when it produced a solid mass of a greyish white. This was ground and washed in boiling water which gave a white powder and, when filtered and dried, became a soft white “earth”. Listing his experiments and conclusions, Klaproth described No. 4. as a yellow glaze: “The white earth, as well as the fossil [rutile] combined with an appropriate flux, and applied on porcelain paste, makes a glaze of a beautiful straw yellow colour.” This was the origin of Titanium Yellow as a ceramic pigment. 1796 Klaproth’s article is published in French in the Journal des Mines, Paris (Vol. 12, 1-9). It is followed by the experiments carried out on French rutile from the region of Limoges at Saint-Yrieix, by the Paris chemist, Louis Nicholas Vauquelin (1763-1829), “Analyse du Schorl rouge de France” (pp.10-27). The two articles on the new metal close with descriptions of its crystalline characteristics by René Just Haüy, “Note sur la cristallisation du Titane” (pp. 28-30). Vauquelin confirmed that his findings with the French “red tourmaline” (rutile) coincided with Klaproth’s on the Hungarian “red tourmaline” (rutile): they are oxides of the metal titanium. Further, he writes that various colours arise from different circumstances of heating the titanium oxide with acids and alkalis. Being a metallic oxide, Vauquelin concluded that it “will become very useful in various arts, and particularly in the art of the enameler, the ceramicist, and the glassmaker, due to the different colours that it is able to take and communicate to the flux, according to whether it is more or less oxidised.” Titanium oxide in the form of rutile was thus declared a pigment, and although the easel painter is not included in his list, it was open to experiment, since metal oxide pigments, from the ochres to the chromes, were being used by both painters and in the ceramic arts. Chromium oxide green, for example, would be taken on by Alexandre Brongniart, the Director of the Imperial Porcelain Manufacture at Sèvres, in 1798, as a beautiful green pigment. 1796 Alexandre Brongniart (1770-1847), “On the Colours Obtained with Metallic Oxides and Fixed by Fusion on the Different Glazed Bodies”, “Sur les couleurs obtenues des oxydes métalliques, et fixés par la fusion sur les différens corps vitreux”, Journal des Mines, Paris, Vol. 12, 1796, 58-80. In referring to titanium, Brongiart writes that he had so far been unsuccessful in using it at Sèvres, obtaining only a “dirty yellow and of very variable tones” (77). 1801 The French chemist, Antoine François, Comte de Fourcroy (1755-1809), wrote that titanium, “as an oxide, especially when purified and refined by its fusion with alcalis, can be used very advantageously to colour glazes, faiences and porcelains. It is already being used to make a beautiful straw yellow on porcelain in Berlin, and if at Sèvres they have given up using it for browns, not being able to rely on a uniform colour, it is undoubtedly because traces of iron in the native oxide can cause variations in the vitrification and the tone. Purified and more oxidised, however, a bright yellow colour as used in Berlin can be made.” Fourcroy also foresaw the possibility of obtaining other colours from titanium, writing: “In fact, by varying its state of oxidation and its association with other oxides, it can be expected to be able to obtain violets, oranges, brown and greens of many various tints.” This was cited by an Art Nouveau ceramacist, Louis Franchet (“Le Rutile et ses propriètiés colorantes”, Société d’historire naturelle d’Autun, 15th Bulletin, 1904, 124-5), who developed red, green and a beautiful blue for his works one hundred years later, writing that he had exhibited 250 pieces at the Universal Exhibition in Paris in 1900. He also used titanium white on his ceramics. 1801 René Just Haüy (1743-1822), a French mineralogist and crystallographer (and an editor of the Journal des Mines), described titanium oxide based on the work of Klaproth and Vauquelin in his Traité de Minérologie of 1801, Vol. 4, 295ff. In Vol. 3, 129-136, he described another crystal which he called ANATASE, saying he was naming it thus because the word means “extended in height”, a reference to its crystalline structure. It was not until his revised edition of 1822, however, that Haüy grouped anatase and rutile as two types of titanium oxide, based on their characteristics and structures. He writes that it was obtained from Oisans, in the French Alps. 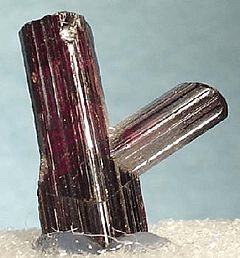 1803 Abraham Gottlob Werner (1749-1817), a German geologist, gives the name RUTILE to the “red tourmaline”. 1828 1864), determined that it “possesses an excess of oxide” while at the same time it “absolutely plays the role of an acid”. He proposed, then, that “titanic oxide” should also be called “titanic acid”, the two terms becoming interchangeable in the literature. (H. Rose, “On Titanium”, “Sur le Titane”, Annales de chimie et de physique, 23, Paris, 1823: 353-377; first published in Mémoires de l’Académie des Sciences de Stockholm, 1821.) Rose then proceeds to experiment with different acids with which he produced different colours, from yellow to red, to green and to blue. Then in his 1828, “On the Preparation of Titanic Acid”, “Sur la Préparation de l’Acide titanique” (Annales de chimie et de physique, 38, Paris, 1828, 131-133), Rose appears to be analysing a titanic ore, for he distinguishes “titanium iron”, “le fer titané“, and rutile in his article where he describes how to obtain pure titanium from it. It is a pure white powder, and he says that if it is slightly yellowish then that is because it contains trace amounts of iron oxides. This would remain the received opinion until the early 20th century. The pure white titanium powder was the base substance for making pigments. 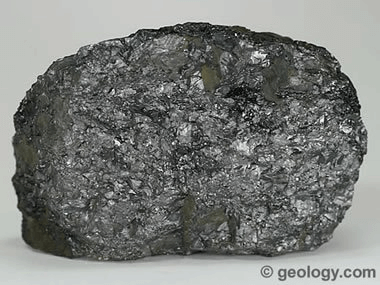 1827 Ores of titanium oxide were discovered in the Ilmen Mountains in the Southern Urals, in Russia, and named ILMENITE by the chemist and mineralogist, Adolph Theodor Kupffer (1799-1865). 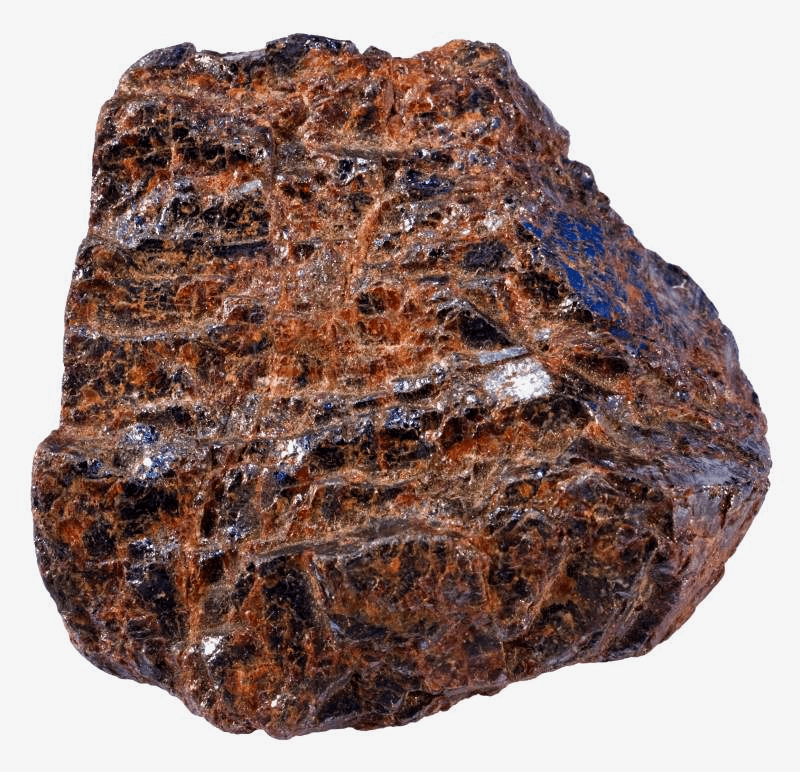 Ilmenite may be composed of the anatase form of titanium dioxide in conjunction with iron oxide, haematite. Titanium Yellow – Klaproth noted that he had obtained a straw yellow glaze by mixing titanium oxide and a flux, and Fourcroy had remarked that the Sèvres manufacture had been making a brown titanium pigment but had found it difficult to obtain an evenly-tinted glaze so had stopped using it. The Director, Alexandre Brongniart, had rejected it but may have taken up the straw yellow glaze because he included it in his book of 1844, Traité des arts céramiques, although he wrote that it, too, was a difficult pigment from which to obtain an even tone. Artificial Rutile – In the 1840s and 50s especially several papers were published on the making of mineral crystals in chemists’ laboratories, the initiative coming from their investigations as geologists into the circumstances of their creation in the earth. As one of the scientists addressed it: “In order to recognise the chemical phenomena that governed the formation of mineral types and, then, in order to bring light onto the chemical history of the globe, one of the most effective means consists without doubt in discovering how to artificially imitate the mineral.” (G. A. Daubrée, “On the Artificial Production…”, 1849, p. 129) By making crystals in a porcelain tube under controlled conditions – the use of certain acids, vapours, temperatures – Daubrée, as well as de Seramont in 1851, deduced what would be the natural conditions in which the crystals were formed in the earth. The chemist, Jacques Ebelmen, reiterated that, with “chemical synthesis [of] a large number of mineral types in a state of purity…, valuable ideas on the origin and conditions of the crystallisation of these types will be obtained” (“Sur une nouvelle méthode…”, 1851, p. 74). Ebelman, however, envisaged yet another use. For in becoming Director of the Royal Manufacture of Porcelain at Sèvres in 1847 on the death of Brongniart, Ebelmen recreated minerals chemically in their crystal form not only to develop substances for making ceramic pastes and glazes, but he also remarked that this would help “to develop industrial applications from this method of crystallisation”. (“On a New Method for Obtaining Crystallised Combinations…”, p. 36) The history of this is to be developed, but Ebelmen described how, using hydrochloric acid and boiling potassium, he had produced crystals that were “identical to rutile” (69). The science was there for making artificial rutile, it was published, and it could be exploited by every industrially-minded entrepreneur who wanted to produce the thousands and thousands of ceramic tiles required in the late 19th century in France in the increasing demand for architectural ceramics. It would then become a question of how to produce a very white titanium white. 1847 Jacques Joseph Ebelmen (1814-1852) was appointed Director of the Royal Manufacture of Porcelain at Sèvres on the death of Alexandre Brongniart. “On a New Titanium Chloride and on Several Other Combinations of this Metal”, “Sur un nouveau chlorure de titane et sur quelques autres combinaisons de ce métal”, Annales de chimie et de physique, 3, Vol. 20, 1847, 385-397. 1849 The French geologist and chemist, Gabriel Auguste Daubrée (1814-1896), published his investigations into the artificial production of rutile which, being crystals, could be grown in the laboratory under certain atmospheres and conditions. He published his findings in, “On the Artificial Production of Several Kinds of Crystalline Minerals, Particularly Tin Oxide, Titanium Oxide and Quartz. Observations on the Origin of Titaniferous Veins in the Alps” / “Sur la production artificielle de quelquest espèces minérales cristallines particulierement de l’oxyde d’étain, de l’oyde de titane et du quartz. Observations sur l’origine des filons titanifères des Alpes”, Annales des Mines, 15, Paris, 1849, 129-155. 1851 The French geologist and chemist, Henri Hureau de Senarmont (1808-1862), published, “Expériences. Sur la formation des minéraux par voie humide dans les gites métallifères concretionnés”, given at the Académies des Sciences on 21 March 1851, and published in Annales de chimie et de physique, 3rd Série, Tome 32, 1851, 129-175. 1851 Ebelmen, “On a New Method for Obtaining Crystalline Combinations by the Dry Method”, “Sur une nouvelle méthode pour obtenir des combinaisons cristallisées par la voie sèche”, Annales de chimie et de physique, 3rd Series, Vol 33, Paris, 1851, 34-74. 1865 Paul-Gabriel Hautefeuille obtained his doctorat in Science and Physics in 1865 with his thesis, “Reproduction des metaux titaniferes” / Reproduction of Titaniferous Metals. The First Ceramic Titanium Whites – The French Art Nouveau ceramicist, Louis Franchet, opened his article of 1902, “Rutile and its Colouring Properties”, writing: “For a while now rutile has taken such an important place in the arts of fire that I thought it would be interesting to share the result of my own research on the colouring properties of this mineral”. Despite the apparent commonness of a titanium white pigment, information is difficult to find, which leaves descriptions of recipes to be forthcoming. Franchet, however, is specific: he applied “bold streaks of ivory yellow or titanium white” between his titanium blue and copper red, adding that “the ivory is one of the most beautiful enamels produced with Rutile” (129, 131). Certainly there was titanium white being used in the manufacturing of architectural ceramics, especially tiles, and this is apparently the case of the tiles made for the walls of the Paris metro, produced by Boulenger and Co. of Choisy-le-Roi, so knowing their methods would add much to our knowledge of obtaining the whiteness. For achieving a good white colour was said to be difficult, and this was described by the English ceramicist, W. J. Furnival, in his Leadless Decorative Tiles, Faience, and Mosaic of 1904. Although he writes that, “under favorable conditions titanium oxide imparts to porcelain a fine yellow color”, according to an American report of 1901, to obtain the whiteness suitable for making artificial porcelain teeth, “the walls of the muffle [kiln] are coated with clay before each firing, thus effectually preventing reducing gases from injuring the ware”. This porcelain was made up of “kaolin, feldspar and silica” to which the titanium oxide “is mixed with the paste in quantity varying with the color wanted, from one-half of one percent, to several per cent”, and as “the production… has been estimated to reach eight millions annually, and in all of these titanium oxide is the pigment employed”, “shows the degree of success which has attended its used in the dental industry”. Thus is introduced a most essential factor in obtaining a good white pigment: the conditions of firing, and although Furnival does not mention the heat, this will be found to be another essential factor. 1887 Hippolye Boulenger et Cie., Faîencerie, in Choisy-le-Roi, is commissioned to produce two-thirds of the white ceramic tiles that would be installed on the walls of the Paris metro by 1902. It is said that their whiteness is due to the tiles having been made with titanium white. 1900 Louis Franchet displays 250 ceramic pieces at the Universal Exhibition in Paris, many of which were decorated with coloured titanium glazes. 1902 Louis Franchet, “Le Rutile et ses propriétés colorantes”, Bulletin of the Société d’Histoire naturelle d’Autun, Vol. 15, 1902, 129-135. 1904 William James Furnival, Leadless Decorative Tiles, Faience, and Mosaic, Staffordshire. 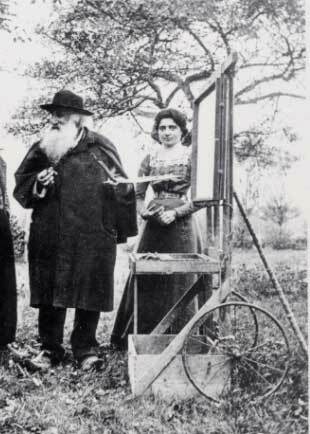 Camille Pissarro and his daughter at the outdoor easel, Eragny, 1890s. The First Artists’ Titanium Whites – Composite titanium white was found on the outdoor easel of Camille Pissarro, pictured above. This composite white consists of a small amount of titanium white mixed with barytes and china clay (kaolin), the very components of porcelain paste or glaze. It was discovered in analyses carried out by Laurette Thomas of ArtAnalysis, Paris, 2005, and is the first document of this pigment on a painter’s easel. Pissarro died in 1903 so the pigment could date from the 1890s. That a ceramic pigment had passed to the easel of a French Impressionist painter makes up part of the history of pigments since antiquity, the migrating of pigments from one art to another was anything but unusual. And the fact that so many of the new 19th century metallic pigments had originated in the ceramics industry – the chromes among the most outstanding – makes it surprising that so little of the history of titanium white ceramic pigments has been published. And this despite the fact that Louis Franchet wrote in his article of 1902 that rutile had gained such prominence “in the arts of the fire”. This history lies with the makers of ceramics, of course, and most of their factories are no longer in existence, but there must be many secrets still to be discovered in their archives if, indeed, they exist. So this is to be investigated for the many dozens of ceramics factories in France, England, Holland, and the rest of 1900 Europe, not to mention the USA. Moreover, if Camille Pissarro had access to titanium white prepared as a pigment for ceramicists, so did many other artists and craftsmen, so its presence was clearly widespread, as it would have been available in the hundreds of little shops in Paris that sold materials for all the arts, the marchands de couleur, or colour merchants. All this was before a new industry sprang up around 1910: the industrial manufacturing of titanium oxide white. 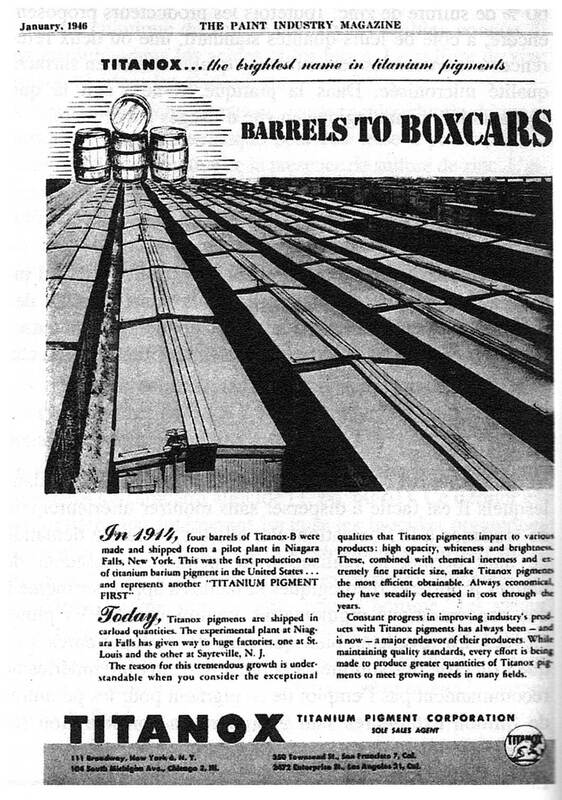 “In 1914, four barrels of Titanox-B were made and shipped from a pilot plant in Niagara Falls, New York. This was the first production run of titanium barium pigment in the United States… and represents another “TITANIUM PIGMENT FIRST”. 1 • The French government had been promoting the discovery of a white pigment since the late 18th century which would take the place of white lead, a pigment that was toxic to workers in the production process, and to artists in the dust from powders. Zinc white had become popular in the 19th century but it did not have the whiteness or density of the lead pigment, so to mix these two pigments and add a small amount of titanium white both brightened the mixed pigment and gave it opacity. It is hard to say when various mixed white pigments first appeared on the painter’s palette, but it could certainly have been amongst the French Impressionists, a few examples of which are known from the 1890s. 2 • Popova had come to Paris in late 1912 when she studied in the studio of Jean Metzinger and Dunoyer de Segonzac until mid 1913, returning to Moscow in the autumn. She came back to Paris in the spring of 1914, then travelled to Italy, returning to Paris in the summer before she took the train for Russia in August with the outbreak of World War 1. Thus, she had had access not only to all the available French, then Italian, artists’ pigments, brushes and canvases, but she also learned about artists’ practices such as preparing the grounds of canvases. And in France it was not uncommon to use mixed white pigments for the grounds, so Popova may have purchased the ready-prepared composite pigment in France and brought it back to Moscow, or she may have bought the ingredients and mixed it herself which, since she would have had zinc white and white lead as part of her palette, may have been the case. The advantage of mixed whites was that they had various qualities of whiteness and plasticity, and took pigments in different ways so that they would not crack or splinter. 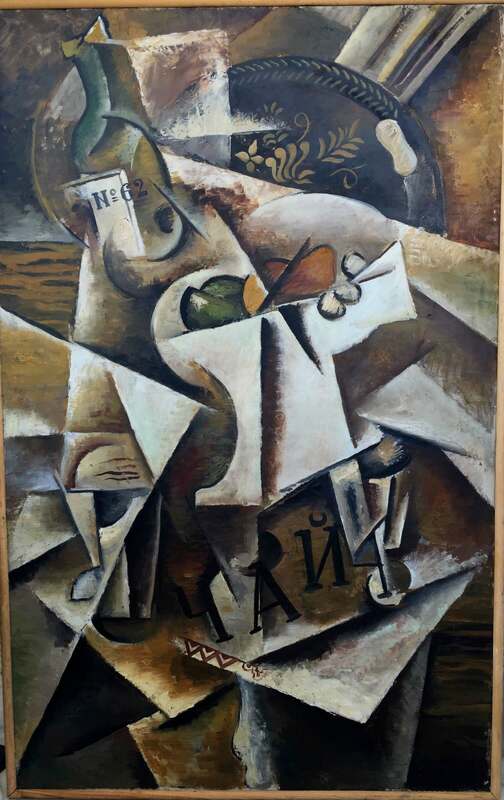 This was part of the craft of producing a long-lasting work of art, and Popova’s painting has no signs of craquelure, according to the chemists’ report. 3 • The painting is fully and evenly polymerised, according to the chemists’ report, and this means that it is 60 to 80 years old, the time it takes for binders (oil and resin) and pigments to bond. 1919 Despite their satisfaction, both the Norwegian and the Niagara Falls chemists were dismayed that their pigments were only “relatively pure” or “substantially white”, and it was not until 1919 that they had achieved their goal of a true white pigment. The cause of the slight yellowing was discovered to lie in two factors: the necessity for mixing the titanic acid with another pigment, an extender, in order to calcine it, and the conversion of anatase to rutile which was discovered to produce the yellowish tint. Concerning the first, because the titanic acid powder was so fine, it passed straight through the filters so by combining it with barium sulphate – or chalk or zinc – it coalesced with the titanium particles and gave them body, necessary in order to make calcining possible. This was noted in 1914 by Louis Barton, but not associated with a parallel necessity in the calcining process. Then it was realised that not only did a composite substance facilitate the calcining process but that the heat should be well below that for firing porcelain. For although the Norwegian and Niagara Falls chemists were using anatase, when it is heated above a certain temperature it converts to rutile, and it is the rutile that gives a yellowish cast – which finally explains why the rutile being used by porcelain manufacturers was producing a yellow colour. The result: since 1913 and 1914, the factories had actually been producing a slightly yellowish rutile white pigment, and this had been on the market as “titanium white”. 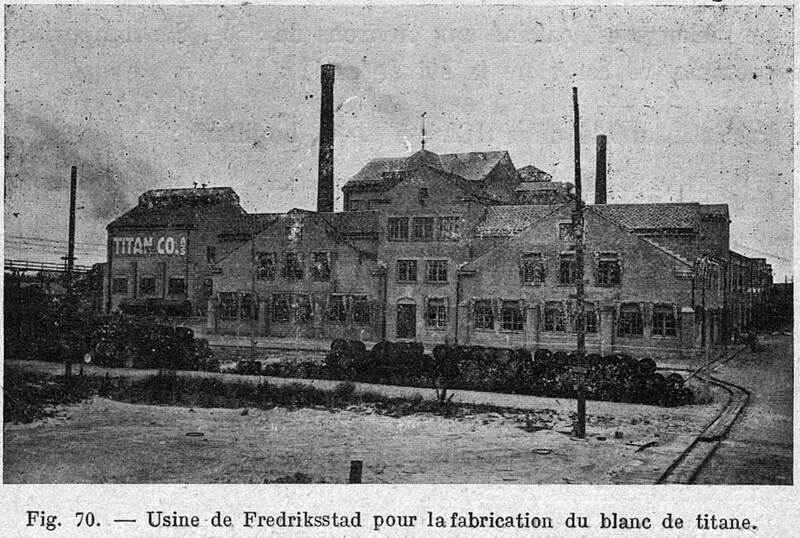 In 1919 they finally produced a truly white pigment, and in Norway it was manufactured in their large plant which had been built between 1916 and 1917, pictured below. Titanium white was now a thoroughly industrialised product produced on a large scale – some eight tons a week by 1922. 1920 Norwegian titanium white, called KRONOS, appears on the market in France and elsewhere. 1921 TITANOX is purchased by the Philadelphia artists’ colourmen, Frederick Weber, who mix it with oil and sell it as a tube paint, PERMALBA.